He was also a prodigious scholar of classical literature and philosophy, and a voracious reader in numerous ancient and modern languages. 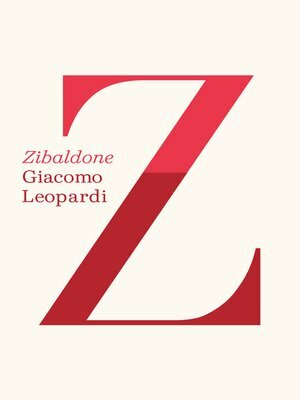 For most of his writing career, he kept an immense notebook, known as the Zibaldone, or "hodge-podge," as Harold Bloom has called it, in which Leopardi put down his original, wide-ranging, radically modern responses to his reading. His comments about religion, philosophy, language, history, anthropology, astronomy, literature, poetry, and love are unprecedented in their brilliance and suggestiveness, and the Zibaldone, which was only published at the turn of the twentieth century, has been recognized as one of the foundational books of modern culture. Its 4,500-plus pages have never been fully translated into English until now, when a team under the auspices of Michael Caesar and Franco D'Intino of the Leopardi Centre in Birmingham, England, have spent years producing a lively, accurate version. This essential book will change our understanding of nineteenth-century culture. This is an extraordinary, epochal publication. Franco D'Intino is the co-editor of Zibaldone. Michael Caesar is the co-editor of Zibaldone.